There are three things you need to know before I tell this story. Firstly, my father is generally a fairly dignified person. He’s more Yes, Prime Minister than Monty Python. This means that on the occasions that he’s not, it’s disproportionally funny, and the event tends to live on (and on) in the collective family memory. Secondly, my father, being Dutch, speaks many of the major European languages with a fair degree of fluency, and enough of the rest of them to translate museum blurbs, talk to taxi drivers, and negotiate with rug merchants (you should absolutely take these three examples as indicative of the kind of vacations we took). He is also possessed of the remarkable talent for finding that one guy in the small rural village in Turkey who not only speaks Dutch, but used to live in the same small obscure village in the Netherlands that my father did as a child. Thirdly, the summer after my sophomore year of college we went on vacation to Turkey, and some of the best food we ate came from truck stops on the side of the road. They didn’t serve anything fancy, but the beans that came out of the pots that seemed to be simmering on the back of the stove at every place we stopped were always exceedingly tasty. So this story takes place on a sunny summer afternoon at a gas station/restaurant by the side of a minor highway in Eastern Turkey. This was not the kind of place where they got enough (or any) tourists stopping by that the proprietors spoke English, and apparently nobody there had done any guest work out of the country in their youth because the only language they spoke was Turkish (which, fair enough – but Turkish is not one of the languages my father has absorbed). My mother and I used the point and gesture method of communication to order a bowl of rice and beans. My father as per his usual wont preferred something lighter for lunch, and asked for a plate of yogurt. This was the first difficulty. They had yogurt, but they were dubious about serving just a plate of it; yogurt being, in their experience, being more of a condiment/sauce than a meal. However, after some inspired gesturing a large plate of thick plain yogurt was procured and set down in front of my father. This is the point at which the event tipped over the edge from mildly entertaining travel story into family legend. Confronted with what amounted to a small ocean of yogurt, my father tried to ask for some honey to sweeten it. As it turns out, if you don’t know the word for honey it’s fairly hard to pantomime honey as a concept. My father started the proceedings by miming pouring honey over his (dauntingly) large plate of thick plain yogurt. Our server conveyed complete confusion without difficulty. Undeterred, my father pulled out a pen and tried to draw a bee hive and bees on a paper napkin. My father is many things, but a gifted artist is not one of them and it’s possible that his drawing looked like something but it definitely wasn’t something you’d want to put on food. Our server continued to radiate bewilderment. As a last resort my father stood up and tucked his hands into his arm pits and buzzed like a bee while turning in lazy circles beside the table. My mother and I had not particularly quiet hysterics, while the server looked more and more alarmed by this display. My father paused in his emulation of a swarm of bees and pointed at the plate of yogurt. Our server eyed the yogurt, eyed my father, eyed the yogurt and eventually clearly decided to humor the crazy man and went away. He returned a few minutes later with a deeply skeptical expression and a plate of ground coffee which he ceremonially handed to my father. My father ate the yogurt plain. What makes it even funnier is that when my mother and I got tea after lunch, it came with honey. I’d hazard a guess that pretty much every culture has some variation on beans and rice. This makes sense, it’s cheap, filling and in combination forms a complete protein. Because this Tuesday was Mardi Gras, I went Cajun and simmered red beans with smoked ham and serving them up with grilled andouille sausage, smoked pork chops, and a very non-traditional riff on collard greens. In a large heavy pot sauté the onion, garlic and celery in a little olive oil until softened, but not browned. Add the dried herbs and spices and cook for 30-60 seconds to bloom the spices. Add the chopped smoked ham or sausage and soaked beans. Stir to coat well in all the spices. Add the water/stock, Tabasco sauce, and ham hock (if using). Bring up to a boil, then reduce to a vigorous simmer, cover and cook for 1 ½ hours. Remove the cover, stir and continue to cook at a vigorous simmer for 1 hour. Remove 1 cup of the beans and mash to a paste. Stir the paste back into the beans and cook for a further 15 minutes to thicken the sauce/reduce to the consistency you desire. This can be (possibly even improves by being) made a day in advance and allowed to sit in the fridge and mellow overnight. Reheat over a low heat, stirring frequently to prevent burning (the pureed beans have a tendency to sink to the bottom of the pot and burn). You may need to add a little extra water/stock at this point. Serving Notes – You can serve this up one of two ways. 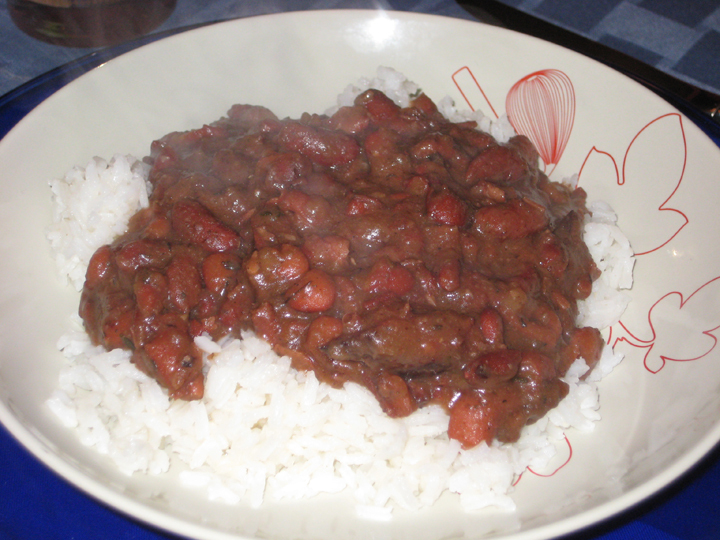 You can either add in another ½ lb of smoked ham or smoked sausage at the end (don’t add the full 1 lb of meat at the start of the simmering, because the 2 ½ hours of cooking will leach a lot of the flavor out of the meat and into the beans, so you want to reserve half to add at the end for a more concentrated flavor). 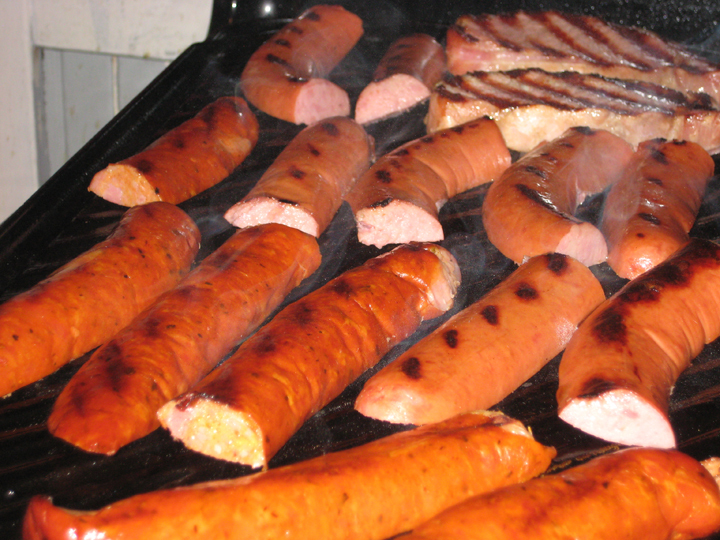 Or, you can do what I did which is grill up some smoked sausage, andouille and smoked pork chops (or really any variation on smoked meats/sausages) and serve them on the side, in which case you really don’t need to add more meat to the beans. I used andouille sausage, smoked turkey kielbasa and smoked pork chops. I cut the sausages in half lengthwise and then grilled everything for about 3-4 minutes/side on a hot oiled grill pan until just heated through and then sliced them into smaller chunks so everyone could have a little of everything. This is exceedingly loosely based on a recipe I came across on epicurious, which is to say I nicked the pickled apple recipe from them and cobbled the rest together from other recipes and the exigencies of the moment. Core, quarter the apples and then slice into 1/8” wedges. Bring all ingredients except the apples to a simmer in a saucepan. Stir to make sure the sugar is dissolved. Add the apples. Bring the mixture back to a boil. Remove from the heat and allow to cool to room temperature (about 1 hour). Refrigerate. Can be made up to 3 days in advance. * If you live in the US you can get pickling spices fairly easily. If you don’t, almost all the ingredients for pickling spice are probably already in your pantry, or their in mine at any rate. There are any number of recipes out there on the internet for pickling spices, but this one is fairly representative – http://www.chow.com/recipes/10594-pickling-spice. Slice out the thick center rib on the collard greens. 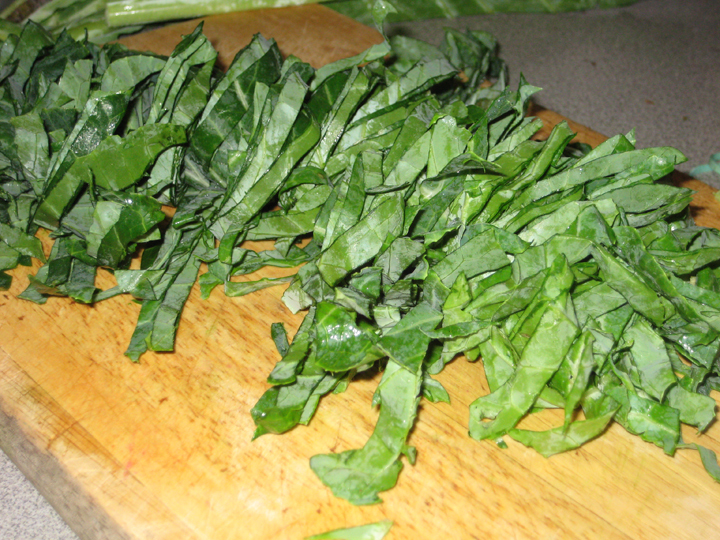 Stack each half collard leaf, roll and then slice into ribbons. Toss the collard greens with enough dressing to lightly coat them. I find that if you toss the greens by hand then you’ll end up massaging them just a little which helps break the greens down a tad – much like with the massaged kale salad (only the collard greens need less vigorous action). 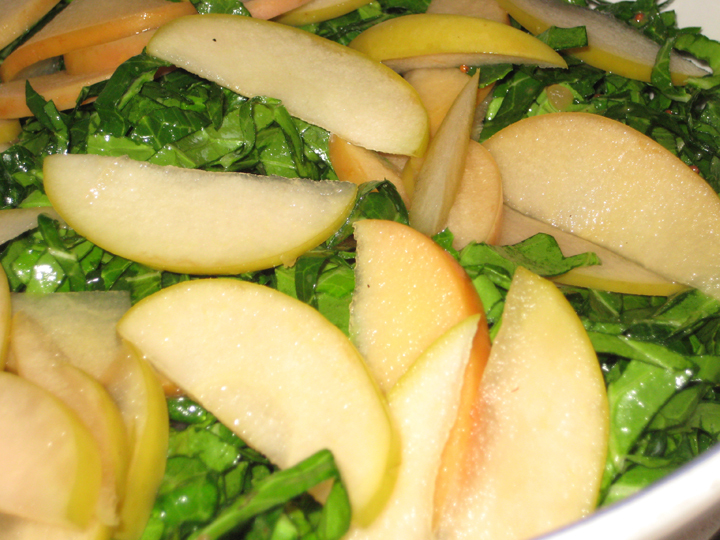 Arrange the salad in layers with collard greens, pickled apples, and chopped peanuts. * The original recipe calls for toasted walnut halves, and I think the slight bitterness of the walnuts would be tasty here, but I was serving someone with nut allergies so I used honey roasted peanuts instead. I did splurge a little and picked up some kettle honey-roasted peanuts from a street vendor in downtown Boston on Tuesday afternoon. To cut the richness of the sausage and beans with something fresh. If you’re going to do a New Orleans themed Mardi Gras celebration, you have to have a drink. It’s the rule. Mix together the Pimms, simple syrup and lemon juice. Pour over the club soda. Stir gently. Add ice as desired. 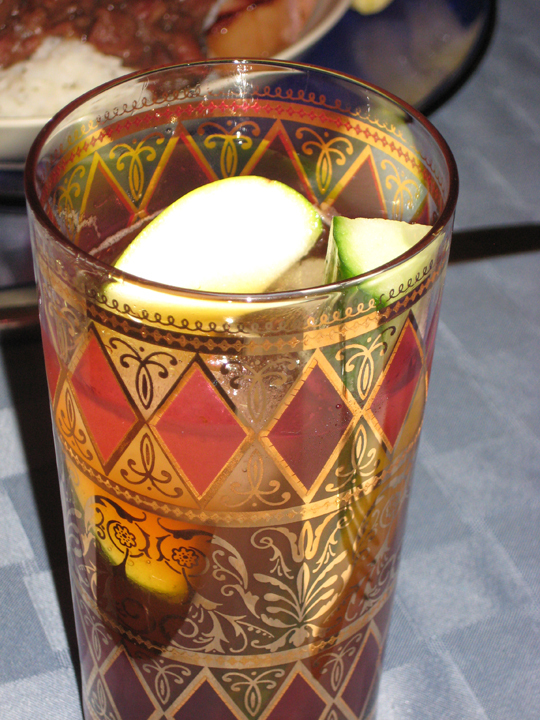 Garnish with cucumber and apple. Enjoy!